ILLAPEL, Chile - Thousands of residents of this small city in northern Chile were sleeping outside Thursday after a powerful earthquake destroyed their homes, a tremor that also forced more than 1 million to evacuate and killed at least 10 people in the quake-prone South American nation. The magnitude-8.3 quake that hit off northern Chile on Wednesday night lasted for three minutes, causing buildings to sway in the capital, Santiago, and prompting authorities to issue a tsunami warning for the Andean nation's entire Pacific coast. 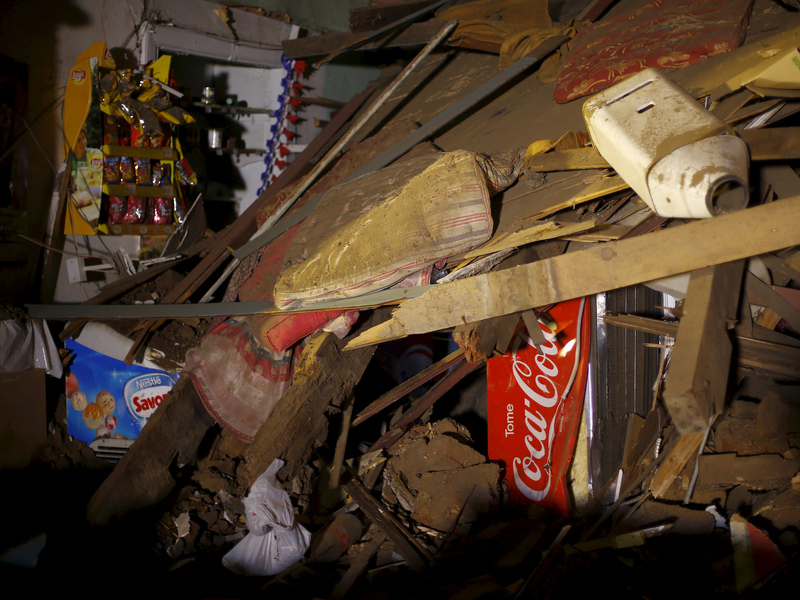 Dozens of smaller aftershocks rattled the country through the night. People sought safety in the streets of inland cities, while others along the shore took to their cars to race to higher ground. CBS News correspondent Kris Van Cleave reports tsunami warnings cover much of South America's Pacific coast, Hawaii and 300 miles of the California coast. "I thought it was the end of the world and we were going to die," said teary-eyed Manuel Moya, 38, sleeping with his wife on the ground outside their destroyed home in Illapel, 175 miles north of Santiago and 34 miles east of the quake's epicenter. The town and surrounding areas have about 35,000 residents. Numerous aftershocks, including one at magnitude-7 and four above 6, shook the region after the initial earthquake -- the strongest tremor since a powerful quake and tsunami killed hundreds in 2010 and leveled part of the city of Concepcion in south-central Chile. That magnitude-8.8 quake and ensuing tsunami killed more than 500 people, destroyed 220,000 homes, and washed away docks, riverfronts and seaside resorts. While Wednesday's tremor was strong by any estimation, the 2010 quake was 5.6 times more powerful in terms of energy released, according to the U.S. Geological Survey. "Based on all available data, a major tsunami is not expected to strike the state of Hawaii," the Pacific Tsunami Warning Center said in a statement late Wednesday, according to CBS affiliate KGMB. "However, sea level changes and strong currents may occur along all coasts that could be a hazard to swimmers and boaters as well as to persons near the shore at beaches and in harbors and marinas. The threat may continue for several hours after the initial wave arrival." Tsunami advisories, less urgent than watches or warnings, were also issued for California and New Zealand. CBS Los Angeles reported the advisory went into effect at 6:45 p.m. local time for coastal areas from San Onofre State Beach to Ragged Point, according to the National Tsunami Warning Center. Estimated tsunami start times would begin Thursday morning as early as 4:46 a.m. for Newport Beach; 4:47 a.m. for the Los Angeles harbor; and 5:06 a.m. for Santa Barbara. NOAA said, "Widespread inundation of land is not expected for advisory areas." The maximum wave height was expected to be less than a foot. Chile is one of the world's most earthquake-prone countries because just off the coast the Nazca tectonic plate plunges beneath the South American plate, pushing the towering Andes cordillera to ever-higher altitudes. The strongest earthquake ever recorded on Earth happened in Chile -- a magnitude-9.5 tremor in 1960 that killed more than 5,000 people.